This blog explores failure behavior in context of AWS Lambda functions being invoked by (transactional) MySQL triggers. There is no transactional coordination between an ongoing database transaction during trigger execution and a AWS Lambda functions invoked by the trigger: a function failure does not necessarily cause a transaction rollback and vice versa: no transactional guarantees, aka, no consistency guarantees, are provided out of the box by the combination of MySQL triggers and AWS Lambda function execution. It is a DIY moment. Client initiates the execution of functionality asynchronously by submitting a request, and immediately receives the response that the request was accepted (or not). In the following I focus exclusively on event style execution and all discussion as well as implementation is in context of this style. Retrieving the result or status of asynchronous invocations is done via polling, not callback. In context of this blog, the client initiates the invocation by inserting a row into a table. The insert initiates a trigger, that in turn calls an AWS Lambda function. The function execution result is placed into the row. If an error happens, error information is recorded in the row instead of a result. The client can retrieve the result, the status or any error that took place by querying the table. In order to know which row to look for, the client can insert a ‘correlation_id’ and use that as primary key to determine the row it is looking for. fib. This column is inserted by a client stating the Fibonacci value it wants computed. value. This column will contain the Fibonacci value corresponding to ‘fib’ as it is computed by the function invoked. It is null if it is not computed or an error occurred. correlation_id. This column is inserted by the client in order to distinguish the different rows (aka, asynchronous invocations). success. This column is a Boolean value indicating the success of the invocation (MySQL uses 1 for true, and 0 for false). error_sqlstate. This column contains the MySQL ‘errorstate’ in case an error happened. error_msg. This column contains the MySQL ‘msg’ in case an error happened. error_errno. This column contains the MySQL ‘errno’ in case an error happened. There are different possible points of failure during the trigger execution. Given the combination of MySQL triggers and an AWS Lambda function invocation, the various failure points are discussed next. Basically, when an insert takes place, the AWS Lambda function ‘fibonacci’ is called. The results is given to the recursive descent parser that I implemented for extracting the ‘output’. The output is analyzed and either inserted into the row, or if there is a failure, the error is inserted. The continue handler catches every exception and inserts detailed error information into the row. The service implementation, not client, would ideally perform any error handling and retry logic in order to get to a final resolution (of success or terminal failure). The client should not be involved in error recovery and resolution unless the server exhausted all possible error resolution possibilities. In terms of MySQL, the error handler uses the ‘continue handler’ condition so that it can insert error details into the row. The trigger logic is built so that after an error the trigger execution is completed (and not continued after the failure point). One possible way to actually implement forced errors at the various failure points is to introduce a deterministic chaos monkey that creates a failure on command as follows. A ‘Chaos Monkey’ database function is implemented (in a very simple deterministic approach at this point) causing different failures based on the various input values. The chaos monkey is invoked in 3 locations: before, during, and after the AWS Lambda function invocation. The induced errors and their triggering input values are discussed next by failure point. Again, the error message coming back only states that there is an out of memory error, not that the set limit was exceeded. To distinguish the errors and to determine the reason requires parsing the error message. This is a bummer for various reasons. A network problem was encountered, not sure why, and it was intermittent. So errors happen, and this unexpected error makes the point of this blog (and its subsequent ones) quite nicely. I tried to find a complete list of possible AWS Lambda errors, but was not able to. At this point in the discussion the errors, if they take place, are recorded. The upcoming blogs will focus on error recovery, and what has to be in place in order to actually be able to recover. A big role plays the function type and behavior. A function that is idempotent can be simply invoked again and trigger execution can continue. If a function is non-idempotent, it might be that the function was executed, but the result was never obtained by the trigger (aka, the return value was lost). Unless it is known if the function was executed successfully, it is impossible to recover from the error correctly and completely. The function provides a idempotency token. This invocation style requires that the client generated a separate token for each invocation, and uses the same token for a repeat invocation to indicate that this is an attempt to execute the function again. The function implementation, receiving the idempotency token, understands that this invocation is a probing invocation and can return the result if it was already computed or initiate the computation. As a teaser the following requires discussion next: what type of function invocations chains are assumed? In each case, every function can be either idempotent or modifying state without being transactionally bound or coordinated with the trigger. Since AWS Lambda functions and MySQL triggers are not transactionally bound, errors during execution can leave an inconsistent state behind. If consistency is required even in the presence of failures, error detection, analysis, recovery and resolution has to be designed and implemented in the triggers as well as AWS Lambda functions. Today the journey of invoking a AWS Lambda function and storing its result into a table is completed. Some more issues had to be overcome. The previous blog left off with the realization that in MySQL 5.6 there is no native facility to parse JSON objects as returned from the AWS Lambda invocation. To keep things simple, I implemented a recursive descent parser in MySQL (not 100% complete, only the part needed for this blog – still missing functionality to be implemented later as needed). The parser also extracts a property being sought for at the same time. Fundamentally, given a JSON document and a property name, return the property value and JSON type if the property exists. Otherwise the value is SQL NULL; this allows for testing if a value was found or not. Current_char contains the character in question at this point of parser execution, and next_char_index points at the next character to be examined. The table has four columns, one holding the number for which the Fibonacci number should be computed for, one holds the Fibonacci number, and two columns for error handling – one holding the error code, and one the error message. This then causes a trigger to be executed that computes the Fibonacci number via AWS Lambda invocation and inserts the resulting value (or error message). The trigger is explained next. The trigger invokes the recursive descent parser. If a result is found, it is added to the row the user is inserting. If no value is found, code and error message are set. If there is any error being raised, this is recorded in the row as well. The AWS RDS web user interface sometimes does not work. When I made a change to my MySQL instance, the change was not recognized by the UI and I could not apply the change. The resolution to this is using the REST endpoints in order to modify the MySQL instance. A bigger “issue” is that the function “lambda_sync” provided by AWS is formatting (pretty printing) the resulting JSON document before returning it adding ‘0A’ for pretty printing. It took me a while to realize that. This ensures that any formatting characters added by lambda_sync are removed before parsing starts. In order to be able to efficiently work while implementing the recursive descent parser I installed MySQL locally not using the hosted version. This was very convenient and a route to consider. In summary, I was able to implement the AWS Lambda function in such a way that a single function can be invoked from MySQL as well as via the AWS Gateway providing the same result structure. In principle, the trigger mechanism allows the invocation of functions as well as their result processing – even though there is no support infrastructure from that provided by AWS. I assume this will get addressed over time by the appropriate upgrades of MySQL as well as making the lambda_sync function available. 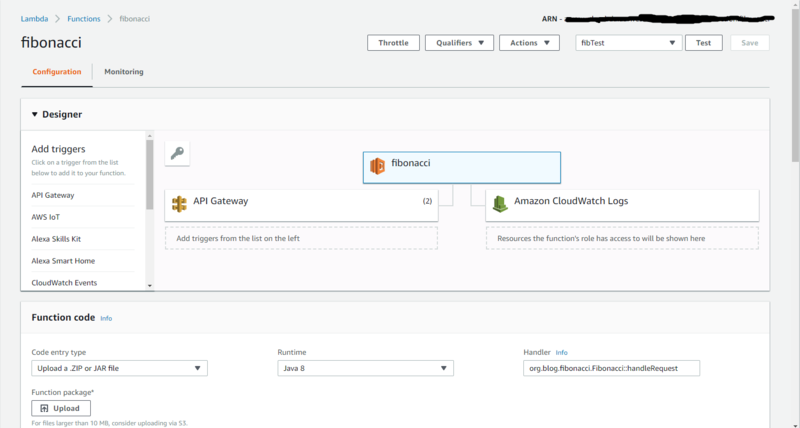 In the previous blog an AWS Lambda function is invoked through the API Gateway by a client. How do I invoke (trigger) the same AWS Lambda function by a relational database? This blog sets up MySQL first as preparation, including a database trigger. I followed CHAP_GettingStarted.CreatingConnecting.MySQL.html to create an RDS (Relational Database Service) MySQL instance. Now logging in from the MySQL Workbench on your laptop using the master user name and master user password is possible – that is going to make development for MySQL easier. Turns out, creating a MySQL RDS Instance was a wasted effort for the goal that I set myself. It is not possible to call a AWS Lamda function from an MySQL RDS instance. Bummer. However, it is possible from Aurora MySQL. So, I started over and created an Aurora MySQL. Once I had Aurora MySQL setup and running, I could continue with the MySQL user, table, trigger and function definition specification inside Aurora MySQL. I’ll refer to Aurora MySQL as MySQL for short in the following. Having the user setup, now a table can be created by that user. The idea is to use the table as the invocation interface. A value is inserted into a column (representing a function parameter), and after the function is executed the result is stored in another column into the same row. Each row therefore has the function parameter value as well as the corresponding return value. In my case the function is the Fibonacci function. For example, calling it with 0 will return 0. Calling it with 10 will return with 55. At this point I have the whole infrastructure available in context of MySQL and the functionality in place. This is the basis for incorporating the AWS Lambda implementation of the function implementing the Fibonacci computation next. Once it was clear that Aurora MySQL is required, the setup of a database user, table, trigger and function was easy as this is done within MySQL not using any additional AWS infrastructure. With the ability to connect to the database instance using MySQL Workbench the development environment familiar to me was available, and that’s great.